Yep, all clergy have heard that joke. And no, it's not funnier because we've heard it 827 times. But I do suspect many people wonder what do we do all week. After all, how long can it take to plan a service, write a sermon, and do all the pastoral care a church requires? Well, since you asked, here's what a typical clergy week is for many of my clergy friends. Depending on church size, denominational affiliation, and full time vs part time, there will be differences (so don't print this out and take it to your pastor, demanding to know why her week looks different). This seriously not scientific study happened mostly over coffee. Getting the church ready for worship: On Sunday, this means lights on, scripture set, coffee made, doors unlocked, information for worshippers set out, and a dozen other housekeeping items that must be done to make holy space ready. But it also means making sure the building is welcoming to the life that happens at the church during the week. My church has gatherings every day of the week, so carpets have to be vacuumed, chairs arranged, calendars coordinated, and doors unlocked. I'm thankful to have a sexton, an office manager, and many volunteers to help, but many of the clergy I spoke with do all of this themselves. And, even with volunteers and staff, the work lands on my desk if it doesn't get done. Many churches are busy on days of the week other than Sunday, as they should be. Speaking of worship: Let me be clear - there are no worship service elves who come in during the middle of the night on Saturday and plan the service. Trust me, I've asked. This responsibility sits with the priest, pastor, and minister. Again, some churches have worship committees, but many don't. A typical Sunday service with no special additions takes anywhere from 4 to 6 hours to plan and prepare for, not including the sermon. And if it's Holy Week, Christmas, or a special day, double that time. Even in the Episcopal Church, where our Book of Common Prayer guides us, there are still prayers, music, and physical space considerations. And my favorite thing - bulletins preparation. An aside, I'm convinced the 7th circle of hell will consist of days alternating between church committee meetings and bulletin preparation. Also, funerals, weddings, and other non-Sunday services demand and are given their own holy time of preparation, often in addition to the Sunday worship. Then there's the sermon: A young priest once said to me, "I really thought I'd spend half of my time as a priest reading, studying, and writing my sermon." I think coffee came out of nose as I snort-laughed. Yes, I wish I could spend that much time on my sermons. I think preaching the Word of God is one of the more important things we do. On a good week, I probably do spend about 10 hours on my sermon, but that time is almost never in-office time. It's evening time or early morning. I've learned once I get in the office, I have too many distractions to allow for the kind of focus I need. Other clergy friends of mine take an afternoon or block of time during the week. We all have what works for us. And yes, there are those weeks when there's too much to do and too little time where we punt. So please remember that if your pastor delivers what seems like an unusually poor sermon or you're certain you've heard that sermon before, ask the Holy Spirit to help you find something in the words to inspire, even if it's that the sermon ended. Pastoral care: This happens every week, and it varies. If Ms. Jones is in hospice and her journey to be with God is imminent, a priest is there. Maybe it's a few hours. Maybe it's every day for two weeks until she dies. I've found that older church members appreciate and expect a clergy visit during illness or hospitalization, while younger members are quite comfortable with a phone call or even a text. People need to talk to a priest, not all of them church members. Marriage and baptism preparation happens regularly in many churches, often in the evening, as most people work. Visits to members who aren't able to attend are vital. And the reality is one person cannot meet the pastoral needs of an entire congregation. Volunteers are so necessary, and I give thanks each day for lay members who respond to God's call in this ministry. Prayer: I hope every minister has time each day dedicated to prayer. Begin the day, end the day, interrupt the day - spend some time each day praying for those in our care, for our own ministries, for God's guidance. And yet, I hear so many clergy lament the lack of a prayer life. I don't think this is a negotiable for us, any of us. Office and property manager: This is the one area where I heard more variance than any other. Some churches (less than 15% in most dioceses) have staff to help manager the office and the buildings and grounds. Most depend on volunteers and clergy. Answering phones, cleaning the church, taking out the trash, buying coffee, cleaning the church refrigerator (where everything goes to die, at least in my church), setting up for events, cleaning up after events, and keeping the books all happen at a church. It is, in one aspect, a business with the normal business things. And, at some level, except in the very largest churches, the minister is involved. The councils of the church: This depends on the denomination and community, but most clergy I know are engaged in the wider life of the church and the wider life of the community, in addition to our own church meetings. We attend meetings at the diocese. We volunteer our skills as chaplains to organizations like police departments and hospitals who cannot afford this ministry. Clergy serve on boards and attend community events. We are innately engaged in the places we live, spreading the Gospel in word and deed by living in the church that exists outside the walls of our own spaces. Study: Yes, most clergy do attend some type of continuing education, and I also hope we are giving ourselves time each week, even if it's an hour or two, to read, to learn, to expand ourselves. We also work to create and support ways for church members to learn about their faith, to share their questions, and to explore all that is our relationship with God throughout our life. We listen to member needs, explore curricula, and recruit volunteers, among other things. If we're teaching a class, leading a Bible study, or offering a presentation, we need time to prepare. So if you see your pastor sitting in a coffee shop reading James Cone, consider it for the good of the Gospel and your church. Self-care: No one can offer what they do not have. If we have allow ourselves to become drained, we cannot do the things we as clergy have vowed to do. We need time to fill up our selves and souls. Yes, a day off helps (and here's where I offer than most full-time clergy I spoke with admitted they rarely get 2 days off a week), but I'm talking here about focused self-care. Regular therapy, physical work outs, attention to nutrition, participation in colleague groups - all those places where we can share our worries, doubts, and fears; where we can get guidance from others; where we can care for this creation of self in a particular way. And a life: I am not a good priest if I do not have a personal life. I am amazed each week at the depth of love I feel for the people who worship with me and who work with me as we share the Good News. And I need to have a life as simply Laurie that is not part of that, at least on the surface. At least some time of each pastor's week should be spent reconnecting to the person God created us to be underneath the collars and vestments. And while it is similar to self-care, it is also less structured. Doing the laundry, catching up with friends, going on dates, spending a day watching Baywatch (don't judge) - all give my soul time to catch up with my body, and all remind me of how beautifully mundane life is. Again, this is not an exhaustive list - it's not even complete for me. But it does give laity some idea of what happens on the days between worship. And if you're really curious, just ask. Most clergy would love to share what they do with members. Great post. I linked to it in the RevGals Weekly e-Reader, where hopefully it will generate some invitations for coffee. 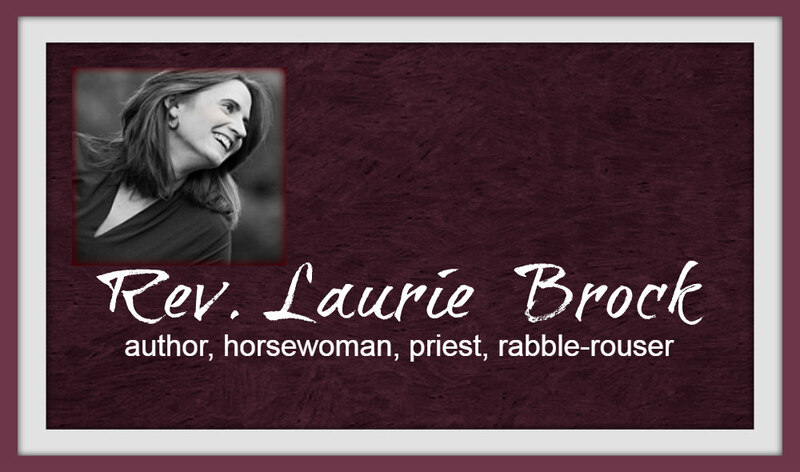 Oh, Laurie!! While I know this from my years at church, volunteering at church, being on the vestry, etc... I had never put it all in one place at one time. It helps me put all things in perspective in our church life and makes my own frustrations seem very small. Thank you for adding clarity & reality into my day! !